PRIZE. 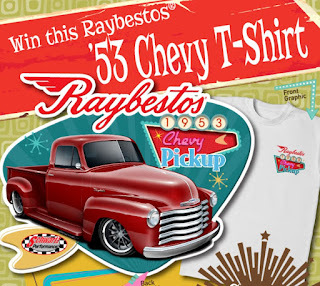 Fifty-one (55) prizes will be awarded, fifty (50) consisting of a RAYBESTOS branded T-shirt (size XL) (ARV $25) and five (5) of a RAYBESTOS branded tacker sign (ARV $35). Sponsor reserves the right to substitute a prize of equal or greater value in the event the advertised prize is unavailable. Prize will be shipped directly to winner by Sponsor. ARV of all prizes is $1,425.